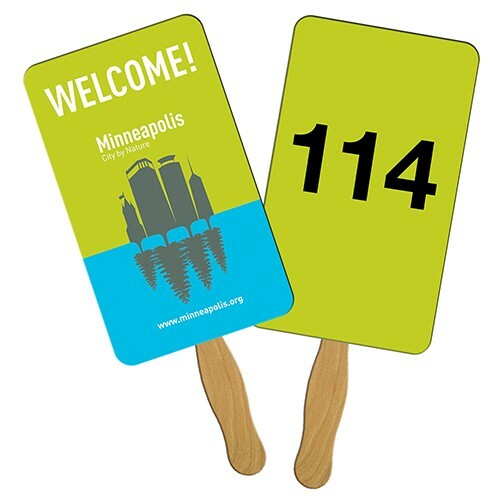 Our AUCTION SANDWICH STYLE PADDLES have a wood or white plastic handle glued between two pieces of card stock so there is no stick showing on the back side and are available in 35 stock shapes. 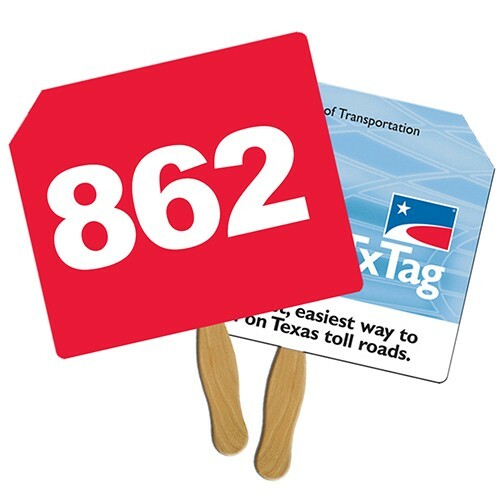 The pricing for the stock shapes includes full color printing and liquid lamination on both sides and consecutive numbering on one or both sides. You choose the start number. 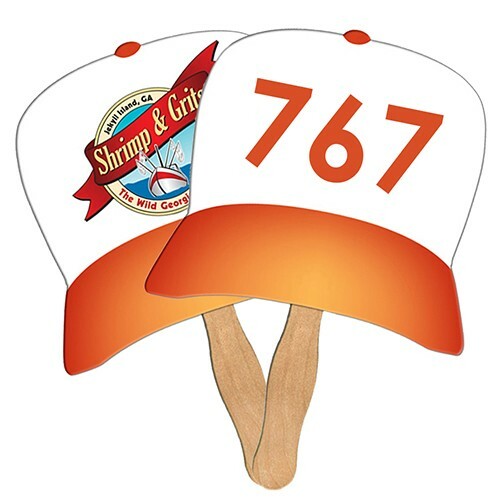 Your custom print on the front and 2.5" black consecutive numbering on the back. 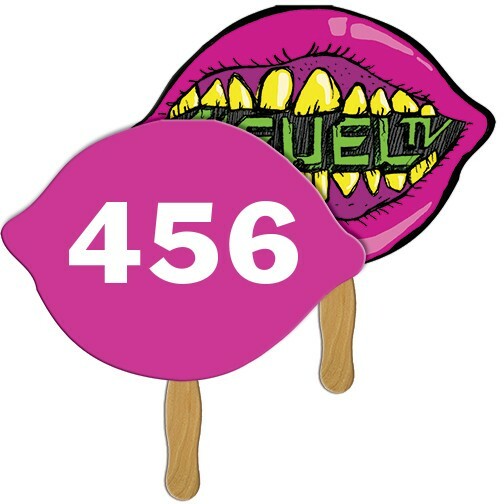 STANDARD pricing below includes a ONE color print. Add a white plastic stick for an additional $0.06 per fan. 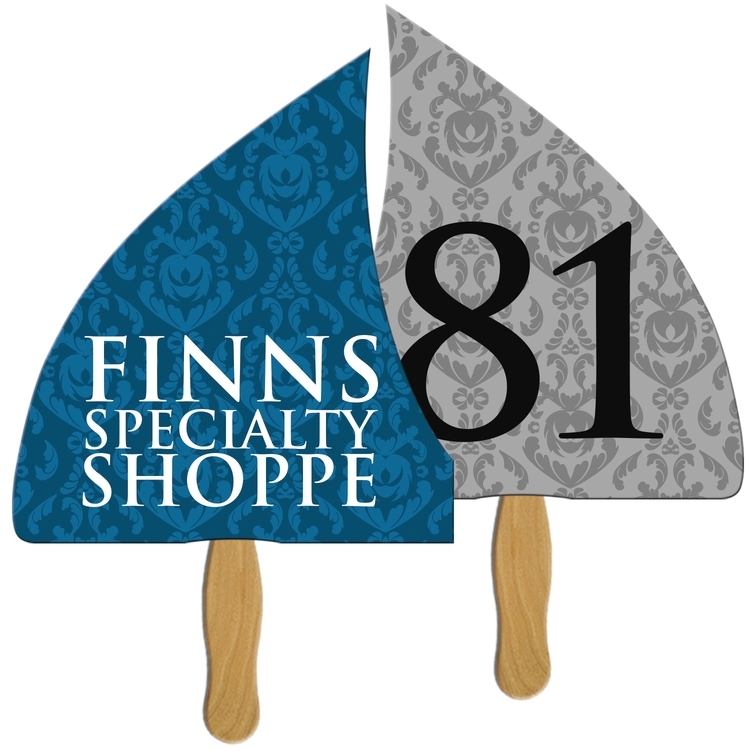 Sandwich Auction Fan - No Stick Showing - with consecutive numbering printed on one or both sides sides. You choose the start number. Digitally printed in FULL COLOR and film laminated on BOTH sides for a high gloss finish on high density white poster board (24 point finished product) with wood handle. 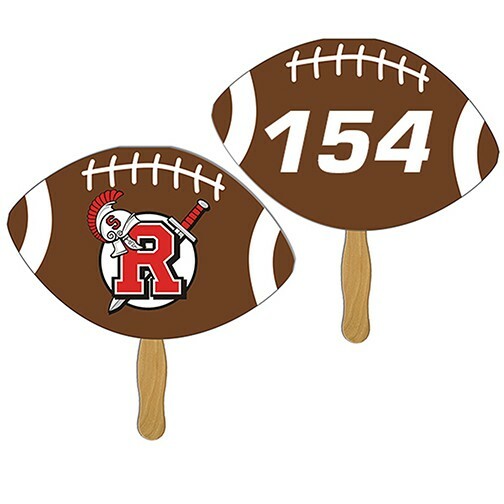 White plastic handles are also available for an additional $0.06 per fan. Production time does not include shipping. Rush production is available, please contact us for a quote. 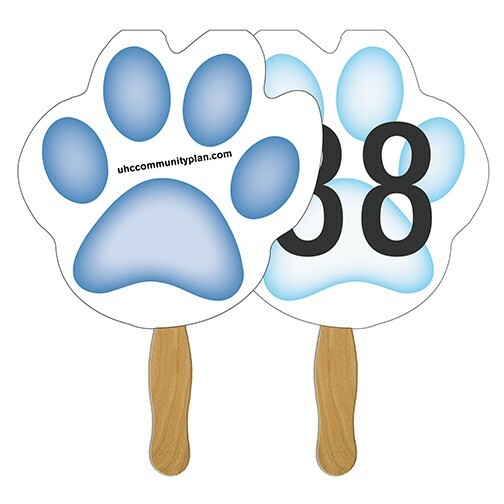 Paw Shaped Sandwich Auction Fan - No Stick Showing - with consecutive numbering printed on one or both sides sides. You choose the start number. Digitally printed in FULL COLOR and film laminated on BOTH sides for a high gloss finish on high density white poster board (24 point finished product) with wood handle. White plastic handles are also available for an additional $0.06 per fan. Production time does not include shipping. Rush production is available, please contact us for a quote. 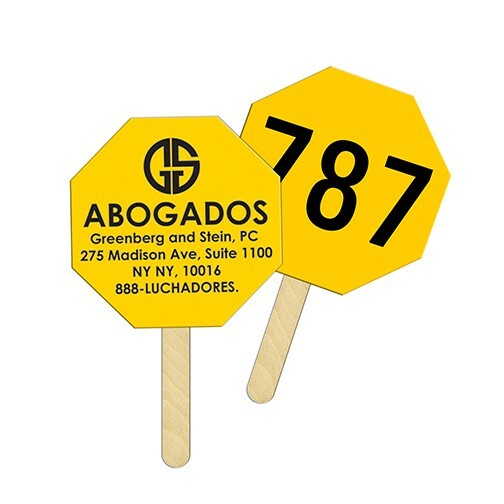 Guitar Pick Triangle Shaped Sandwich Auction Fan - No Stick Showing - with consecutive numbering printed on one or both sides sides. You choose the start number. Digitally printed in FULL COLOR and film laminated on BOTH sides for a high gloss finish on high density white poster board (24 point finished product) with wood handle. 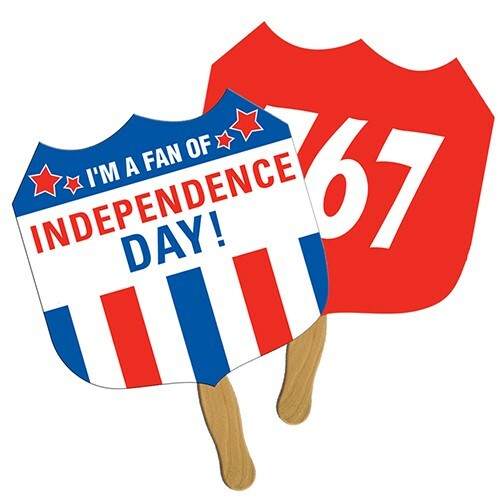 White plastic handles are also available for an additional $0.06 per fan. Production time does not include shipping. Rush production is available, please contact us for a quote. 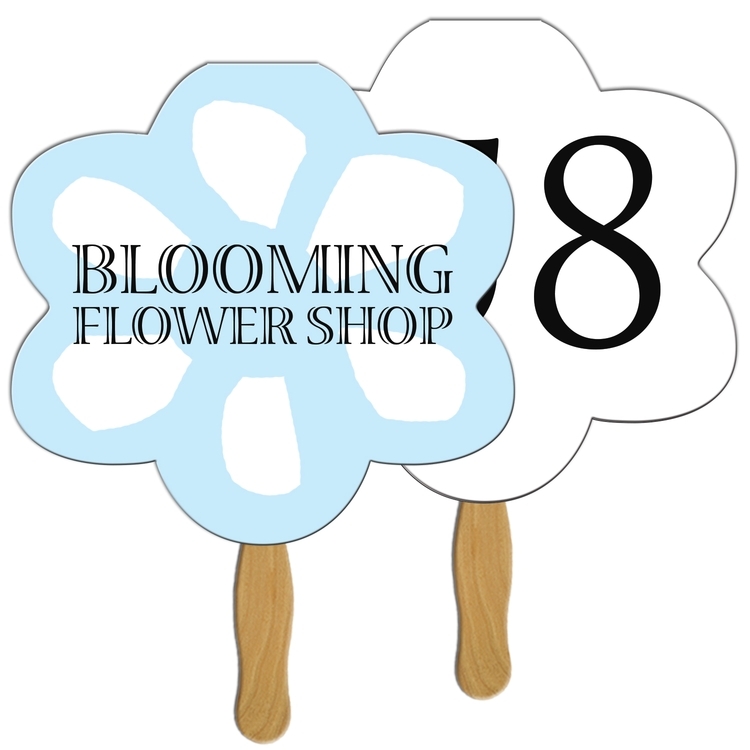 Flower Shaped Sandwich Auction Fan - No Stick Showing - with consecutive numbering printed on one or both sides sides. You choose the start number. 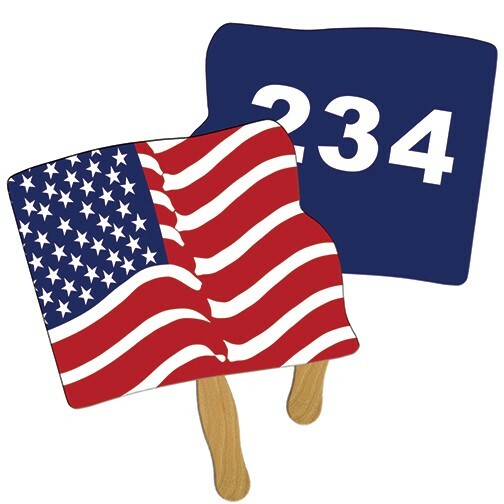 Digitally printed in FULL COLOR and film laminated on BOTH sides for a high gloss finish on high density white poster board (24 point finished product) with wood handle. 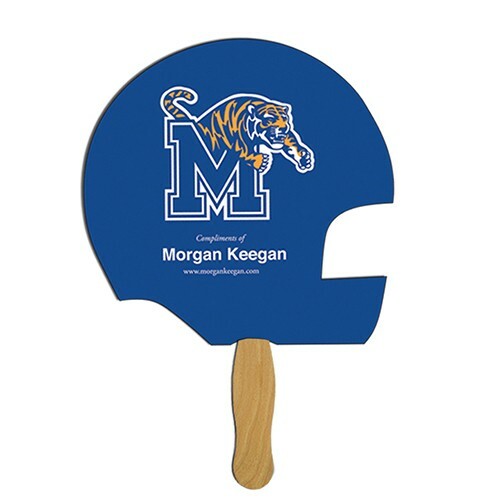 White plastic handles are also available for an additional $0.06 per fan. Production time does not include shipping. Rush production is available, please contact us for a quote. 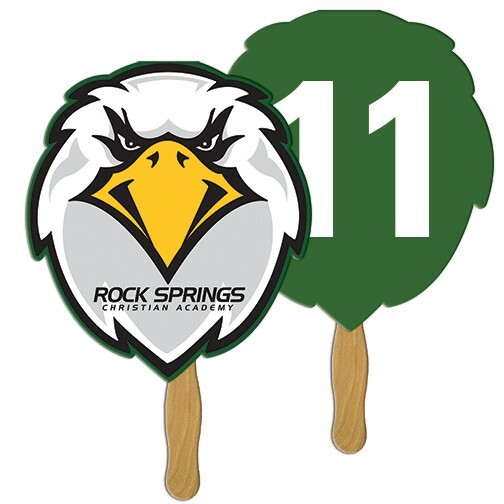 Lemon Lime Shaped Sandwich Auction Fan - No Stick Showing - with consecutive numbering printed on one or both sides sides. You choose the start number. 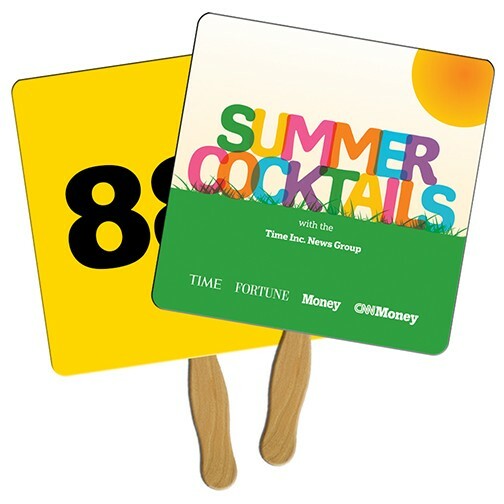 Digitally printed in FULL COLOR and film laminated on BOTH sides for a high gloss finish on high density white poster board (24 point finished product) with wood handle. 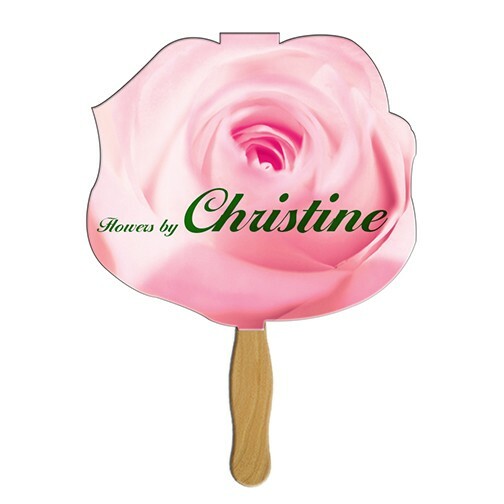 White plastic handles are also available for an additional $0.06 per fan. Production time does not include shipping. Rush production is available, please contact us for a quote. 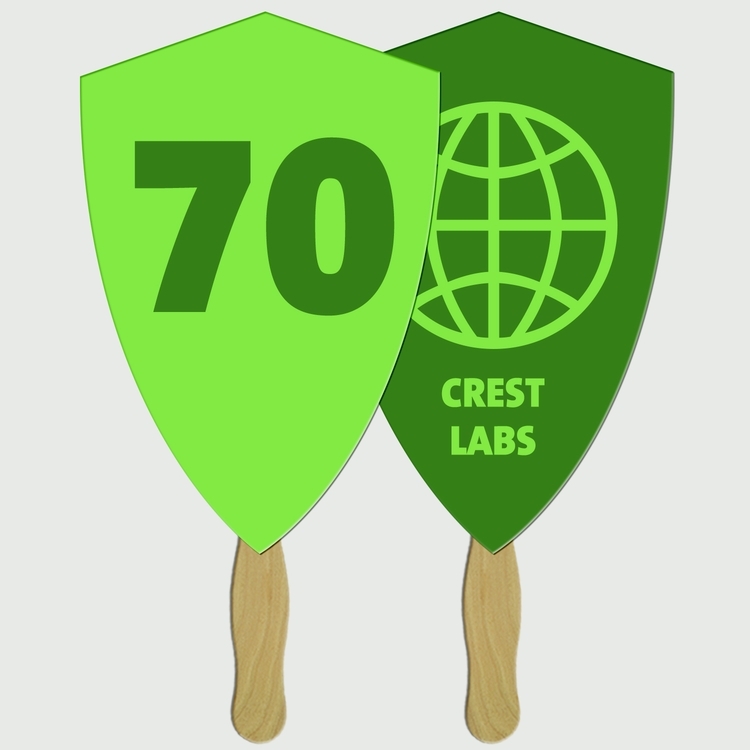 Crest Shield Shaped Sandwich Auction Fan - No Stick Showing - with consecutive numbering printed on one or both sides sides. You choose the start number. Digitally printed in FULL COLOR and film laminated on BOTH sides for a high gloss finish on high density white poster board (24 point finished product) with wood handle. 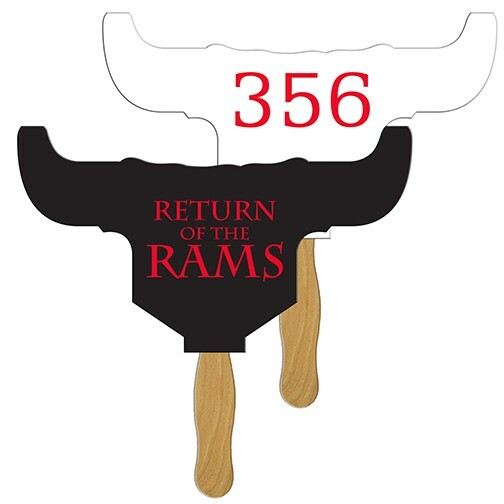 White plastic handles are also available for an additional $0.06 per fan. Production time does not include shipping. Rush production is available, please contact us for a quote. 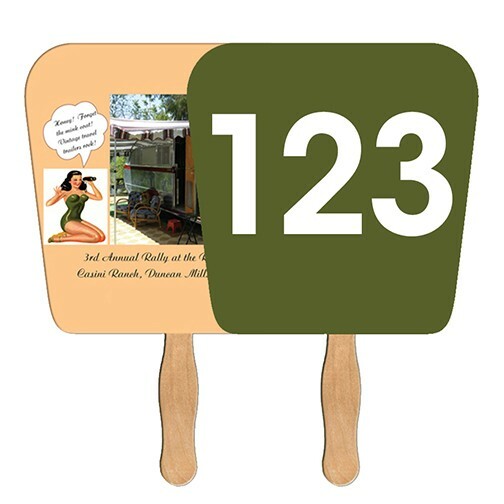 Rectangle Sandwich Auction Fan - No Stick Showing - with consecutive numbering printed on one or both sides sides. You choose the start number. 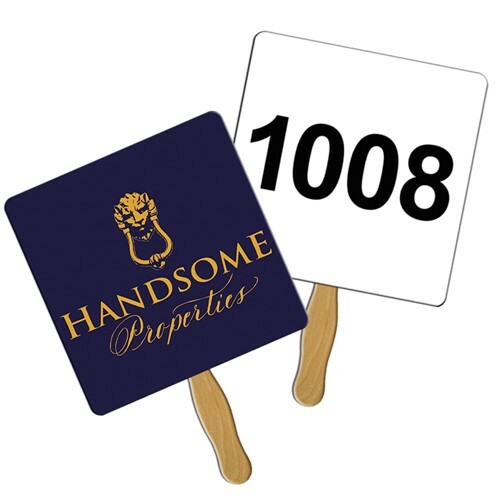 Digitally printed in FULL COLOR and film laminated on BOTH sides for a high gloss finish on high density white poster board (24 point finished product) with wood handle. 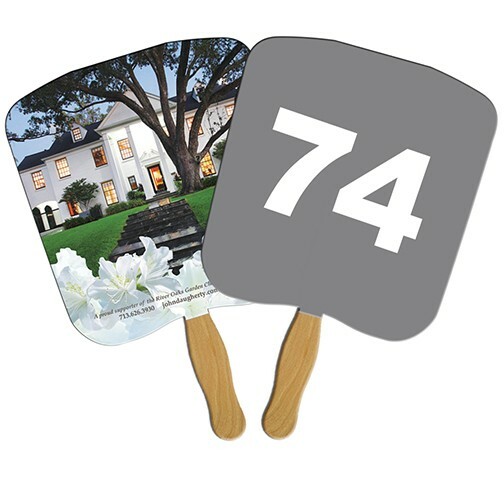 White plastic handles are also available for an additional $0.06 per fan. Production time does not include shipping. Rush production is available, please contact us for a quote. 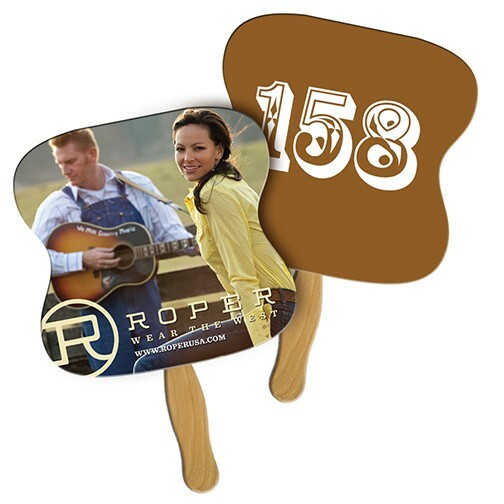 Oval Shaped Sandwich Auction Fan - No Stick Showing - with consecutive numbering printed on one or both sides sides. You choose the start number. Digitally printed in FULL COLOR and film laminated on BOTH sides for a high gloss finish on high density white poster board (24 point finished product) with wood handle. 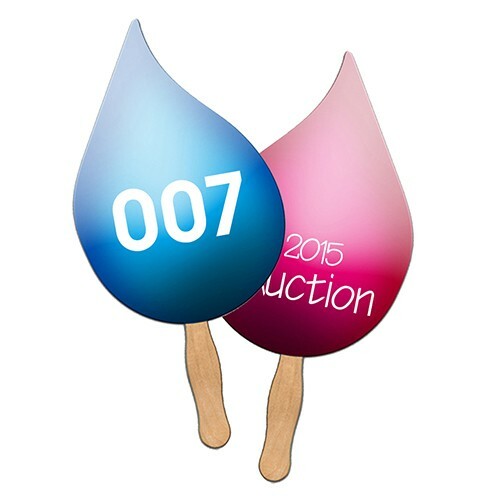 White plastic handles are also available for an additional $0.06 per fan. Production time does not include shipping. Rush production is available, please contact us for a quote. 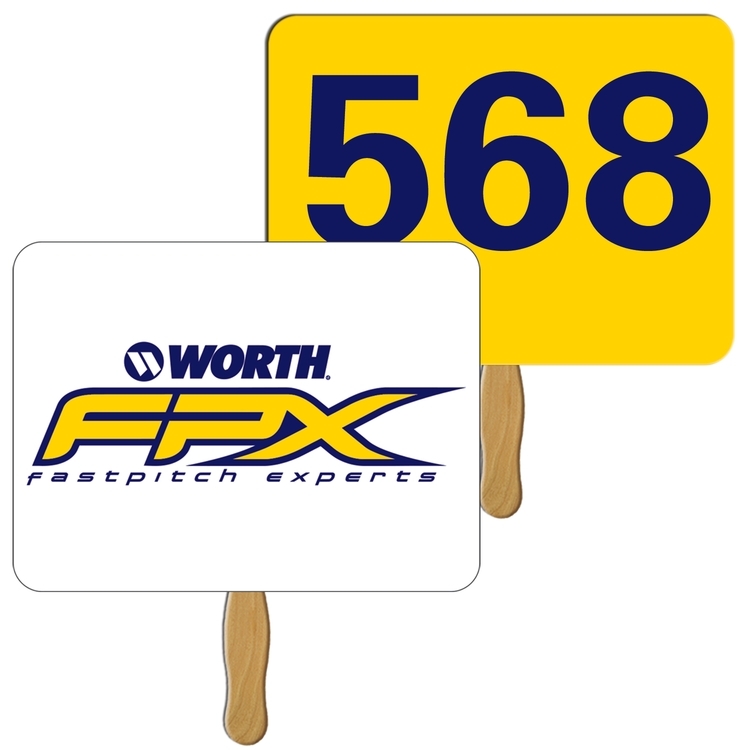 Football Sandwich Auction Fan - No Stick Showing - with consecutive numbering printed on one or both sides sides. You choose the start number. Digitally printed in FULL COLOR and film laminated on BOTH sides for a high gloss finish on high density white poster board (24 point finished product) with wood handle. 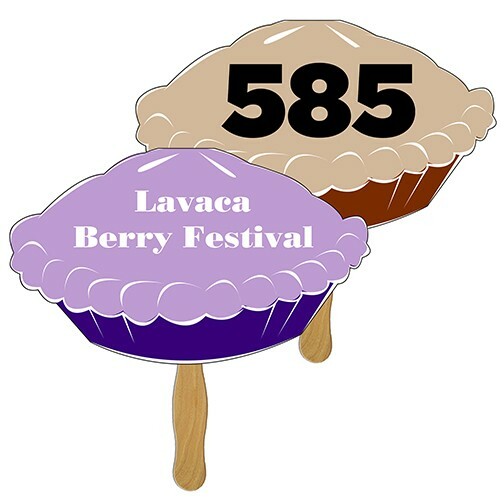 White plastic handles are also available for an additional $0.06 per fan. Production time does not include shipping. Rush production is available, please contact us for a quote. 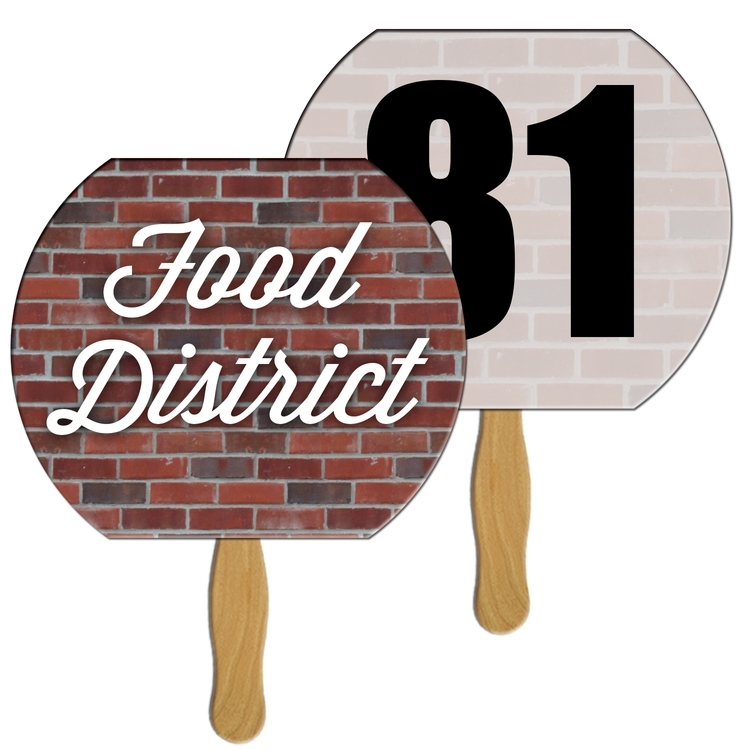 6" (smaller size) Sandwich Auction Fan - No Stick Showing - with consecutive numbering printed on one or both sides sides. You choose the start number. Digitally printed in FULL COLOR and film laminated on BOTH sides for a high gloss finish on high density white poster board (24 point finished product) with wood handle. White plastic handles are also available for an additional $0.06 per fan. Production time does not include shipping. Rush production is available, please contact us for a quote. 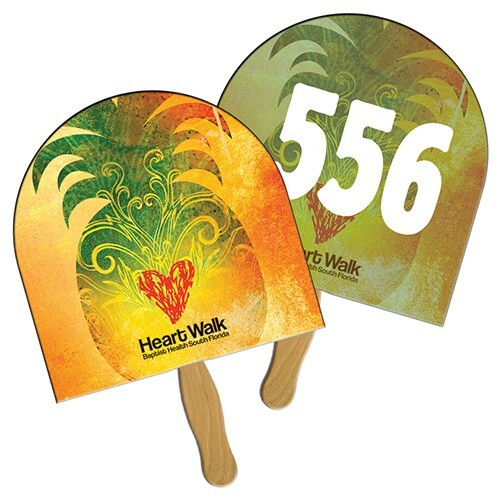 Animal Head Shaped Sandwich Auction Fan - No Stick Showing - with consecutive numbering printed on one or both sides sides. You choose the start number. 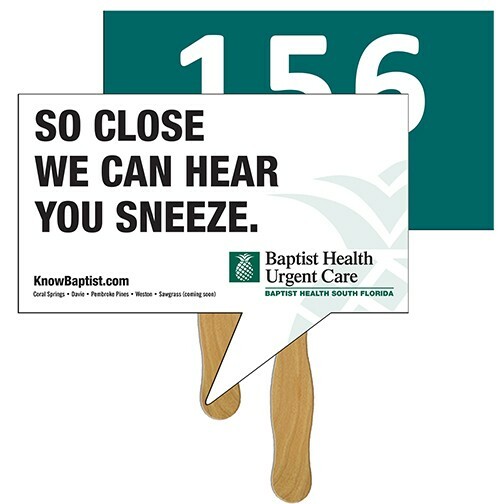 Digitally printed in FULL COLOR and film laminated on BOTH sides for a high gloss finish on high density white poster board (24 point finished product) with wood handle. White plastic handles are also available for an additional $0.06 per fan. Production time does not include shipping. Rush production is available, please contact us for a quote.